One of our most loved varieties for planting is the hydrangea—which is why we’ve brought this popular favorite to you! 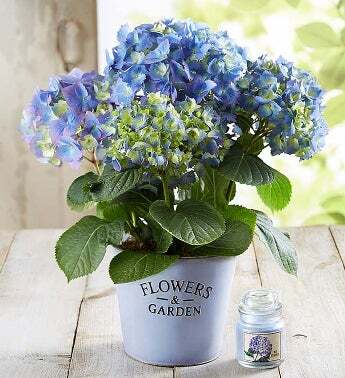 Hardy and long-lasting, with blooms that burst in brilliant blue, ours comes paired with a charming, reusable periwinkle gardening pail, which has the words “Flowers & Garden” beautifully embossed on front. To enjoy the same sweet fragrance anywhere in your home, add our hydrangea-scented candle, the perfect complement to this delightful gift.